This town is full of a lot of people, most of whom are sailors, and most of whom are very rude. Along the eastern side of town are a row of houses and apartments, some of which have coins in them. Remember to shut the door and make sure you're alone before stealing anything. 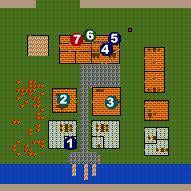 The middle building in the south is a barracks of types, and the last building in the south is a Flophouse, run by Claw the Nephil. Claw won't let you stay there, because you aren't a sailor, and if you have a nephil in your party he'll tell you that he doesn't care much for his own species either. The building just north of the flophouse is a common provisioner, and the building north of the barracks is Merry's shop. There's a pen in the far northwest of town with a couple cows, and that leaves just one building left to explore. This is the Inn, which is run by Carroll. Like pretty much everyone else in Delis, he'll be rude. Standing at the bar is Glydden, who is the only person in Delis who isn't rude to you, at least if you've helped out her soldiers. If you've helped them out she'll give you some advice. If you check out the rooms in the hallway you'll find that there's one you can't enter. Rather than tryng to build up your tool use skill to pick the lock on this room, go outside the inn and check the northern wall for a secret entrance to this room. There's a chest in here, which you'll need either Dispel Barrier Lv.2 or a Piericing Crystal to get through. The chest contains a package that you'll need for a future quest, but taking it will turn the town hostile, so don't do it until you've done everything else in town. Once you've taken the package you'll be able to open the door into the hallway, which is a good thing, since the secret door is now locked. Since the only thing to do here really is talk to Glydden, once you've done that you can loot the chest and then leave town as quickly as possible.